EUGENE, OR--(Marketwired - July 23, 2015) - As the back-to-school shopping season ramps up, SheerID, the leading teacher verification provider, and Agile Education Marketing release the results of their annual survey of K-12 teachers about their spending habits. The average amount teachers spend of their personal funds on their classrooms hovered around $500 for the second year in a row. Agile Education Marketing and SheerID surveyed 536 K-12 teachers and discovered that 71% spent $200 or more out of pocket on school supplies, instructional materials, and professional development for the 2014/2015 school year. The majority spent more out of their own bank accounts than they received from either their school or their school district for classroom supplies. 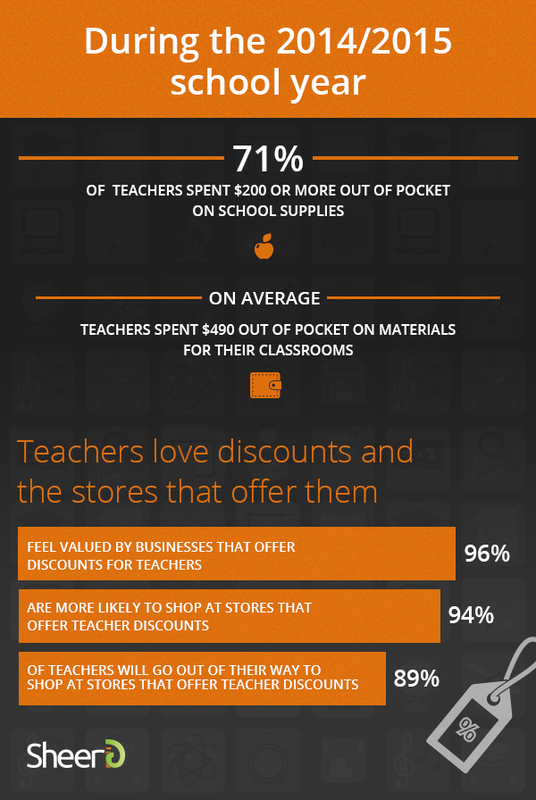 The survey also found that when teachers shop for items for their classrooms and personal use, 89% of teachers will go out of their way to shop at stores that offer teacher discounts, and 96% feel valued by businesses that offer discounts for teachers. 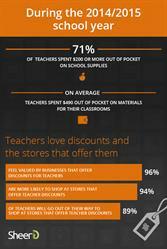 94% of teachers are more likely to shop at stores that offer teacher discounts. "Teachers are very resourceful," says Robert O'Dell, Managing Partner at Agile Education Marketing. "As our survey shows, they'll seek out teacher discounts to stretch their dollars. Many are also turning to the internet to find free or lower cost resources." 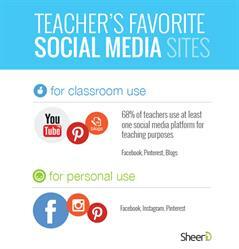 In fact, 68% of K-12 teachers surveyed by SheerID and Agile Education Marketing indicated that they've utilized at least one social media platform, like YouTube or Pinterest, in their classrooms for teaching purposes. Previous research by Agile Education Marketing showed that teachers also shop online twice as often as the average American adult. While teachers appreciate receiving discounts and special pricing online, they are not willing to take risks by revealing extremely sensitive data. This year's survey revealed that 96% of teachers will not disclose their Social Security numbers in order to receive a discount; 71% are not even willing to give out the last four digits of their Social, even if it means saving money. "The beauty of SheerID's verification technology is that we don't need a teacher's Social Security number or financial information to instantly verify their teacher status online, in stores, or on a mobile device," says Jake Weatherly, CEO of SheerID. "Our technology makes it possible for companies to make educators feel valued AND safe, while also protecting the company from fraud." Now that their offers can be gated by verification technology so that only qualified teachers can redeem them, an increasing number of businesses like T-Mobile, Costco, and dozens of software companies are offering exclusive academic pricing this back-to-school season. For a list of teacher discounts available, visit http://www.sheerid.com/deals-we-protect/?segment_name=teacher. For more information on the survey results, go to www.sheerid.com/2015-teacher-spending-survey. SheerID's technology transforms existing, protected private data into an omnichannel service that benefits commercial enterprises and the public, while still keeping the information safe and secure. By acting as a bridge between secure databases, SheerID allows commercial enterprises to accurately, instantly verify whether or not their customer qualifies for a special offer like student, active duty military, veteran, or teacher offers -- protecting the exclusivity of the offer and eliminating fraud. For more on SheerID's teacher verification solutions, visit http://www.sheerid.com/offer-an-exclusive-teacher-discount/. Follow @SheerID on Twitter or Facebook at www.facebook.com/SheerIDdotcom. Founded in 2009, Agile Education Marketing is an innovative education information firm that supports the marketing initiatives of businesses selling products and services to pre-K - 12 and higher education institutions and personnel. Agile's at-school and at-home mailing and email lists, coupled with their knowledge and insight, help education businesses improve their marketing results and maximize their marketing investments. For more information about Agile and their partners, visit www.agile-ed.com. Follow @AgileEd on Twitter or Facebook at https://www.facebook.com/AgileEd.